Great Little Breaks - There are many things that delight us so we've created a unique selection of short breaks with you in mind, to delight you in many ways from a relaxing great little pamper break, a fabulous great little gourmet break or something special for the two of you with a great little romantic break. Booking your short break is easy and includes added extras we know you'll love. Whatever you decide, you'll be delighted. 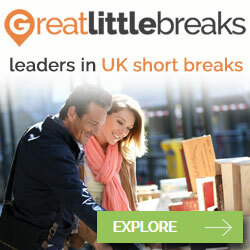 SAVE UP TO 70% ON SHORT BREAKS. Affiliates earn 5% commission on every booking. Greater Anglia - is part of the wider transport group, Abellio Transport Holdings, and we are one of the largest train line companies in the UK. We operate the East Anglia franchise, providing the majority of commuter/regional services from its Central London terminus at London Liverpool Street to Essex, Suffolk, Norfolk and parts of Hertfordshire and Cambridgeshire as well as many regional services throughout the East of England. Our belief is that customers should expect high standards of service throughout their experience with us and we extend this approach to our affiliate partners. Earn 3% commission on sales. Holiday Extras - are the market leaders in the UK travel industry for add on products. In 1983, Holiday Extras revolutionised the holiday extras leisure market, by providing the first UK airport hotels and car parking booking service for the travel trade. Holiday Extras is still independently owned by founder Gerry Pack. Holiday Extras make arrangements for around 2.5 million passengers a year. They offer secure internet bookings so you can book your holiday extras 24 hours a day, 7 days a week. They focus on customers' holiday extras needs offering a comprehensive range of products designed to provide the best choice at the best prices. Their web site won the travel trade paper Travel Weeklys BEST WEBSITE award for 2002. Holiday Extras average transaction values for airport Hotels is $133 and for airport Parking its $70 and they will pay 3.5% (including VAT) for hotels and 7% (including VAT) for parking spaces. HomeAway UK Holiday Rentals - are a leading holiday property rental marketplace that connects holiday homeowners and property managers with travellers who seek the space, value and amenities of holiday rental homes as an alternative to hotels. Holiday Homeowner Leads - Each time a homeowner or property manager you refer to us lists their property on our website. As a HomeAway Holiday-Rentals affiliate, there are 2 ways for you to generate commissions. 1. Earn 15% commission when a customer purchases a subscription to list their holiday rental property on HomeAway Holiday-Rentals. Earn 20% when you generate 5 or more property advert subscriptions; Earn 30% when you generate 12 or more property advert subscriptions. 2. Earn £1.20 GBP when a traveller submits a qualified email enquiry to rent a holiday rental on HomeAway Holiday-Rentals. Homestay.com - is an exciting accommodation choice connecting guests to 50,000 registered local hosts in over 150 countries. It’s a unique and affordable alternative to hotels, hostels and B&B’s. Hosts offer guests the chance to stay with them to live and breathe the local culture and to explore destinations in a truly authentic way. Why promote Homestay.com: Unique Product Offering - Give your customers an alternative accommodation option to Hotels, Hostels and B&B accommodation, Multilingual content - English, German, French, Italian, Spanish, Portuguese, Chinese, New homestay hosts added worldwide daily, Selection of creative banners and text links, 30 day referral/cookie period. Earn 30% commission share when your customers book on homestay.com! Customers pay a 15% deposit fee online to secure their homestay booking. You earn 30% of this 15% deposit paid online. Average deposit value in the region of USD $70, with deposits often exceeding $200 for longer term stays. Hoseasons Holidays - Hoseasons Holidays is the UK’s leading self-catering holiday specialist, with over 12,000 places to stay in coastal and countryside settings throughout Britain, Ireland and mainland Europe. Choose to promote Boating Holidays in the UK; Cottages in the UK; Parks and Lodges in the UK; Cottages and Hamlets in Ireland; Parks in Europe. Sign-up today and start earning a minimum of 4.25%. All Cookies come with a 120 day life span. Hotelopia - is one of the leading travel agencies, offering reservations for hotels, transfers and activity tickets. We make up part of Hotelbeds Group, an established and trusted provider whose head office is based in Palma de Mallorca, Spain. Selling hotels since 2004, our current portfolio boasts more than 70,000 hotels in more than 7,500 destinations worldwide.You will find our website available in 16 languages with the option to pay in 35 different currencies, so with a straight-forward 3 step booking process, and the option in many of our properties to pay online or wait until you arrive at the hotel, we´ve got everything covered to cater to your personal needs. All you have to decide is? where will you stay with Hotelopia? Hotelopia will provide you with all the marketing tools you will need to promote our products: large range of banners, links, product feed, search deep links, a co-branded page and much more! We will be updating our affiliates with all of our internal promotional activity, with information on our top converting destinations, best offers, featured destinations and special promotions. We offer our affiliates a generous commission of up to 6% per booking. See below an example of what you could expect to generate through our programme. With an 6% commission per sale on an average booking value of £250, you will earn £15 per booking! Iberia Express - is an innovative and dynamic airline company based in Spain. They offer flights in Europe and the company operates in code-share with LAN Airlines, Air Berlin, Japan Airlines, American Airlines, Avianca, Finnair, British Airways, Siberia Airlines y Royal Air Maroc. Earn 5.50 EUR per order. IHG Europe - IHG is an international hotel company whose hotels welcome over 150 million guests each year to over 693,000 rooms in more than 4,900 hotels across nearly 100 countries. Our nine hotel brands include some of the best-known and most popular in the world. Join our program, PartnerConnect, and start earning a 3% commission on consumed stays generated from your web site for popular hotel brands including InterContinental Hotels and Resorts, Crowne Plaza Hotels and Resorts, Hotel Indigo, EVEN Hotels Holiday Inn, Holiday Inn Express, Holiday Inn Club Vacations, Holiday Inn Resorts Staybridge Suites and Candlewood Suites. isango! - is a customer's one-stop shop to research and book the best tours and activities online from across the world in a hassle-free and secure way! isango! is a specialist retailer of more than 12000 tours and activities from 60+ countries. We have curated a great range of products to cater to everyone’s needs. From a basic hop-on, hop-off tour to a 7-day trekking expedition in the Atlas mountains, all experiences are handpicked by our in-house destination experts. We work closely with local experts to ensure we deliver only the best to our customers. Earn 6% commission on sales. Jet2.com - is the North’s leading low cost airline flying from 8 airports –Leeds Bradford, Manchester, Newcastle, Belfast, Blackpool, Edinburgh, East Midlands and Glasgow International. Jet2.com fly to over 40 European city, sun and ski destinations fm £13.99 one way inc. taxes including Paris, Rome, Nice, Toulouse, Prague, Krakow, Croatia, Barcelona, Majorca, Ibiza, Tenerife, Corfu, Crete, Cyprus, Geneva, Salzburg and Jersey. Jet2.com are offering £1.30 commission for all bookings originating from the UK and £3 per booking originating from non UK departure points. This programme also cross tracks with the Jet2holidays programme so you will also be rewarded with at least 3% on all holidays sold. Please note that you must be signed up to both programmes for cross tracking to work. Jet2holidays - offers great-value package holidays to exciting sun and city destinations from nine UK bases: Leeds Bradford, Manchester, East Midlands, Newcastle, Birmingham, Edinburgh, Glasgow, Belfast International and London Stansted. Make the most of the low £60pp deposit, convenient flight times, 2 to 5* accommodation, and zero credit card fees. Extremely flexible, customers can choose the length of their holiday stay from 1-21 nights. Some fantastic destinations include the Balearics, Canaries, Mainland Spain, Portugal, Turkey, Cyprus, Crete, Sharm El Sheikh and, new for 2010, Tunisia, Madeira and Tel Aviv. Jet2holidays offers 3% commission on the first 10 sales per month and then award a 5% commission from the 11th sale onwards. The average basket value is £1,200 with average commissions of £36. Just You - is the UK's leading escorted tour operator for single travellers who are keen to see the world with like-minded people. Prices include many excursions and all travellers stay in a room of their own, without paying a single supplement. As a member of the Just You Programme you'll earn up to 6% commission on online bookings and benefit from a 90-day cookie. It really is the perfect time to join, as the 2012 holiday sale is on now! Mercury Direct - is a leading provider of package holidays in the UK to destinations within Europe (Malta & Gozo, Cyprus, Egypt, Madeira, the Algarve, Tenerife, Spain and the Greek Islands) as well as Worldwide (Sri Lanka, Kerala, Bali, Mauritius, Australia, Thailand & Cuba). We are fully ABTA and ATOL bonded and our site has an upgraded security certificate, namely a Verisign Extended Validation SSL Certificate which helps to diminish the effectiveness of phishing attacks against your clients and ensuring that all monies paid by them are secure and protected. Along with Mercury Direct’s wide range of destinations we offer a range of USPs including the ability to fly from 24 UK airports, buy one week get one free, three weeks for the price of two, and no single supplement offers as well as unique site USPs including a large volume of Web 2.0 content including hotel videos and virtual tours. Mercury Direct are paying 3% commission on valid sales.